Sweet gluttony, who could resist? 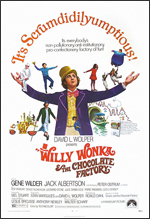 A winning golden ticket offers exclusive admission to tour a magical candy factory. Only problem was, it wasn’t all to be fun and games. A wobbly boat edges closer to its tipping point—an outcome that that would send all aboard plunging into murky brown milk chocolate waters to be sucked down a drain like poor Augustus Gloop. In the darkness, a strobe light splashes illuminating and disturbing visions as the boat careens wildly out of control. The candyland’s offerings were certainly enticement enough, but for good measure, music—quirky rhymes accompanied by sweet melodies—piped pleasantries aplenty into our hypnotized subconscious. The siren songs were designed to play on our haste. As explorers blinded by the lure of discovery, we wanted more, more, more, Do it again! Do it again! The fear was half the thrill. It was like taking another peek at the flying monkeys or another listen to sound of shackles screeching and scraping along the ground at the feet of the Ghost of Christmas Past, or even to experience again the lonely echo of a hotel hallway from the vantage point of a Big Wheel. Duped yes, but undeniably hooked. We certainly remember fondly the Oompa Loompas, doompa dee do, just as we remember the spoiled rotten Veruca Salt. And Violet Beauregarde too, her body inflating into a huge blueberry balloon, bigger and bigger, ready to burst, before it is rolled away, seemingly discarded like trash. The children’s film rows along. When the chocolate factory doors opened, we shot right through in a crazed rush that only children typically execute. When all was said and done, despite an unsuspecting introduction into psychedelia, the journey into the crazy candy emporium and beyond left us relatively unscathed. We look back older, wiser, and maybe even a little younger too. Pure imagination.